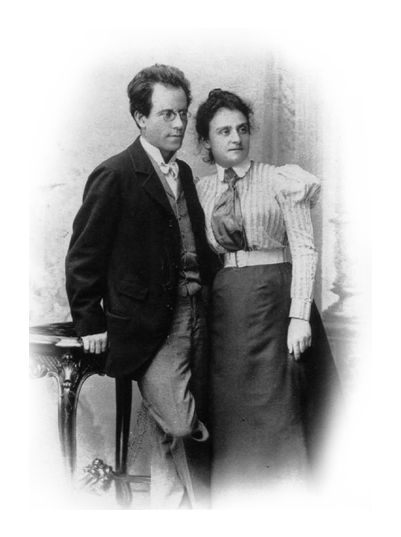 Mahler’s family were Germany-speaking Ashkenazi Jews from Bohemia – a minority within a minority in the sprawling Austro-Hungarian Empire. His paternal grandmother had been a humble iron peddler however his father raised the family’s status first as a coachman, then innkeeper and finally distillery and tavern owner in the bustling town of Iglau. Gustav was the second of their fourteen children; an older brother had died in infancy as did several of his siblings. 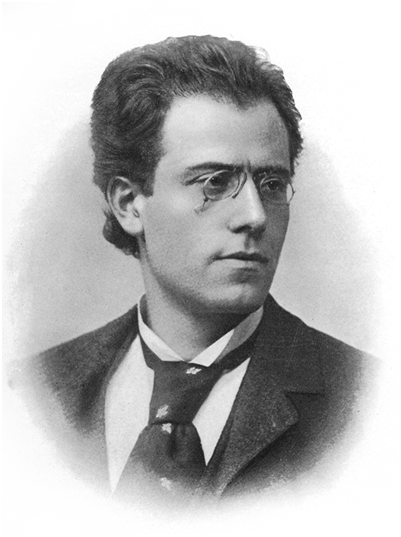 At four Mahler discovered his grandparents’ piano and was encourage by his father to pursue his interest in music. At ten he gave his first recital in the Iglau town theatre. He loved making music, however his school reports suggest he was an unfocused and lazy student when it came to academic subjects. The music Mahler heard around him in Iglau – folk melodies, dance tunes, military marches, horn melodies and trumpet calls – was to echo in his mature works. The third and choral movements of Symphony No. 3 are prime examples of that influence. In April of 1875 Mahler’s 13-year-old brother Ernst died after a lengthy illness. Mahler was devastated and tried to express his sorrow in music. With his friend Josef Steiner the 15-year-old Mahler began work on Herzog Ernst von Schwaben in memory of his brother. It is not known if it was ever completed as no music or libretto has survived. While a student at the Vienna Conservatory Maher was introduced to the writings of Schopenhauer, Nietzsche and other German philosophers. Many of their works and his youthful discussions with his friend Siegfried Lipiner were to influence his work. Later he repudiated the thoughts of Nietzsche to the point where he demanded that his wife Alma destroy copies of the philosopher’s books in their library. Though Alma played the supportive wife she flatly refused. It was a passionate, and at times stormy, marriage. Mahler was not an easy person to live with, he demanded that life be arranged around his artistic endeavours and could be moody and dictatorial. There is disagreement amongst biographers as to whether he forced Alma to give up her composing maintaining that there was only “room for one composer in the family”. It is clear that he was initially dismissive of her work. Later following a period of estrangement, he attempted to woo her back by taking an interest in her compositions and in promoting them. It is perhaps unfortunate that in the last half of the 20th century much of what is known about Mahler came from the memories of Alma Mahler. Her account of her life with and influence on the composer has been questioned as self-serving at best, fiction at the worst. Though we think of Mahler now as a great composer during his lifetime his compositions were secondary to conducting in the eyes of the public. In 1880 he had his first job in a small theatre in the spa town of Bad Hall conducting operettas. He began to work his way up conducting his first opera (Verdi’s Il Trovatore) at Laibach in 1881. Appointments followed in Kassel, Prague, Leipzig, Budapest and Hamburg until finally in 1897 he achieved the gaol he had his eye on: the Vienna Hofoper – known today as the Statsoper. The following year he was appointed conductor of the Vienna Philharmonic. During his ten years at the Hofoper and three with the Philharmonic he was under a constant barrage of criticism from all sides. Much of it was based on the anti-Semitism and pro-German sentiment prevalent at the time but also on his age. There was great indignation that anyone so young, he was 38 at the time of his appointment, was given charge of such important posts. He was to spend ten years at the Hofoper where he conducted over 600 performances, introduced 33 new operas, raised standards to the highest they had ever been, and cleared the company’s debts. But he made more enemies than friends during his stormy tenure. When he left in 1917 to become music director at the Metropolitan Opera and New York Philharmonic his farewell note was torn from the board and ripped to pieces. “Stormy” tenures seem to have been the pattern of his artistic life. Musicians and singers found him demanding and often tyrannical in those demands. He left many positions after altercations with administrators, performers, and other conductors. His personal relationships were often as contentious though there were many, particularly young musicians – Arnold Schoenberg, Bruno Walter, Otto Klemperer – who consider him a friend and mentor. In 1907 Mahler had been diagnosed with a defective heart and the three seasons in New York, though successful, proved too much of a stress. He developed a bacterial infection that affects the heart. He and Alma returned to Europe in April and he died in a Sanitarium in Vienna on May 18, 1911.